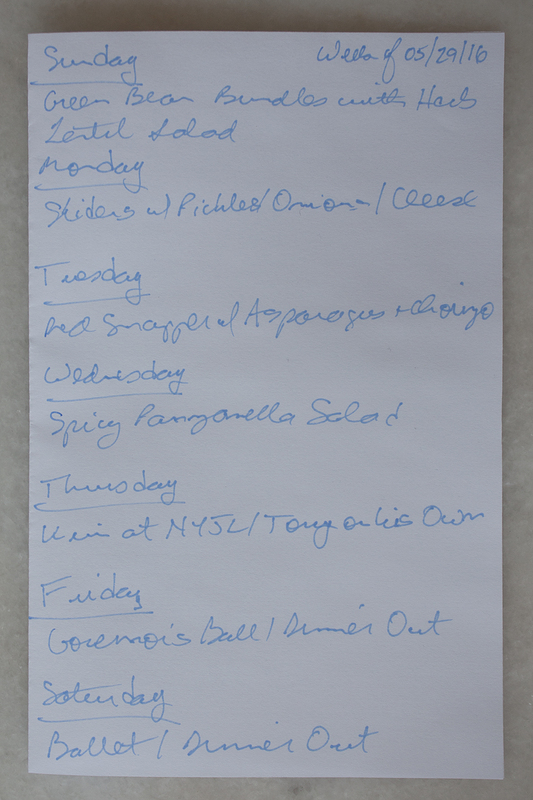 Since we won’t be doing any cooking on Thursday, Friday, or Saturday this week, as Tony will be on his own on Thursday night and we’ll be at The Governor’s Ball on Friday night and the ballet on Saturday night, we tried to find some fun new recipes to start the week. As part of our long weekend, we planned a trip on Sunday to Le District, a fun French market in the Financial District. We thought it would be fun to make something French, ideally with ingredients we were able to find at the market. We settled on Rachel Khoo’s Green Bean Bundles with Herb Lentil Salad. (If you Google that exact term, you will find the recipe on Google Books.) As it turned out, we were able to get all of the most important ingredients at the market: green beans, cheese, prosciutto and of course, lentils. Michael at Columbus Wine and Spirits threw us for a bit of a loop with his pairing suggestion for this dish: a dry Riesling from Napa Valley, namely, a 2014 Trefethen. If you follow our blog you know that Kim adores Rieslings (the drier the better). You also know that we tend to shy away from American wines. Michael was really testing us with this one! Dinner Monday night will be sliders with some fun toppings: in addition to tomatoes, mustard, and both cheddar and bleu cheese, we’ll also have Recipe Girl’s Bread and Butter Pickles (which you may remember from the great pickle-off from June and July of last year) and Easy Pickled Onions from the Shared Appetite blog. We’ll have the sliders with New Belgium’s Citradelic Tangerine IPA. On Tuesday night, we’ll have seafood: Food & Wine’s Red Snapper with Asparagus and Chorizo. We’ve been lucky that the asparagus this spring has been fantastic, so if it seems like we’re making it two or three times a week, it’s because we probably are. We’ll pair this dish up with a 2014 Domaine du Petits Cloches Anjou Villages. Wednesday night will feature The Kitchn’s Spicy Panzanella Salad, made with French bread that we bought at Le District. We’ve made panzanella many times before, but this recipe features a bit of heat from a jalapeño pepper. Michael tossed another curveball our way for this recipe and suggested an Italian wine but a varietal that isn’t often associated with Italy: Chardonnay. We had our reservations about this one (we’ve had some really, really bad Chardonnays, the last of which scared us off Chardonnay almost for good), but Michael has never steered us wrong, so we’ll give this 2013 La Spinona Langhe Chardonnay a try.